Tata Motors has managed to set a new milestone by selling over 4 lakh units of their popular Indigo sedans in India. Tata is now offering an all-expense-paid trip to France as part of their celebration but, this offer is only for buyers who drive home the new Tata Manza before June 30th 2011 (a nice sales trick we say!). The Indian auto giant had launched the first ever model of the Indigo sedan back in the year 2000. Indigo buyers (both private as well as taxi fleet operators) have had a wide range of models and engine variants to choose from. Models of the Indigo such as the first generation Indigo and Indigo Marina (Estate/Station wagon body) have now been phased out and replaced by three new models: the Manza, Indigo, Indigo CS and the Indigo XL. Lets take a look at the Indigo’s journey so far and the various models that have been offered. The Tata Manza launched in 2009, was the second-generation Indigo, with reasonable features & performance to compete with present day sedans like the Maruti Swift Dzire, Mahindra Verito and Toyota Etios. 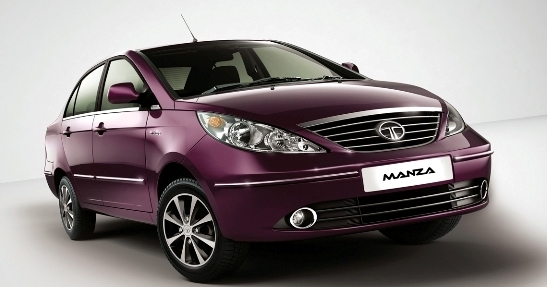 Tata launched a refreshed variant of the Manza called the Manza Elan in February 2011 with some cosmetic upgrades. The fully-loaded Manza Elan is priced at Rs. 7.76 lakh for the petrol variant and Rs. 8.69 lakh for the diesel variant ( All prices mentioned are on-road, Delhi). Another feature on the Manza’s feature list is the time-delayed power windows that operate even after the key has been removed from the ignition, which is ages ahead of the technology the 2008 Indigo eCs offered. The Tata Indigo CS launched in 2008, was the world’s shortest sedan. In May 2010, the company launched the BS4 version of the Indigo CS dubbed the Indigo eCS. Currently, the Indigo eCS is available in four variants, the eGLS and eGLX petrol variants and the eLS and eLX diesel variants. The USP of Indigo eCS is that is measures less than 4 meters (3,988 mm in length) and yet manages to provide 380 litres boot space. The success of Indigo eCS has prompted many auto makers to launch compact sedans. Maruti is planning to launch a compact Swift Dzire and Mahindra will launch a compact Verito (Logan) by 2012. The Indigo compact sedan was basically an Indigo XL with its boot chopped off to save on excise duty. Tata’s old horse, the Indigo’s long wheelbase version, the Indigo XL was launched in January 2007. The Indigo XL has a wheel base of 7.9 inches and is powered by a 1,396 cc petrol engine that makes 101 PS of maximum power while the diesel version is powered by a 1,396 DICOR diesel motor that makes 70 PS of maximum power. The Indigo XL has powered front seats, rear AC vents with separate controls and power windows. The USP (Unique selling proposition) of the Indigo XL is its phenomenal leg room. But, the fit and finish is not up to the standards because, the Indigo XL is pitched in the luxury segment. All these variants and options have helped Tata attain a significant milestone in sales, what remains to be seen is whether this success can continue with the slew of new car launches to happen in the near future.